We always had an issue with our living room because we could never figure out the right placement of furniture. 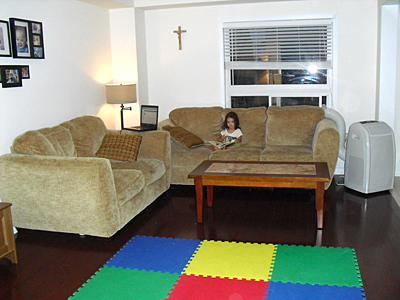 Our sofas were honestly too large for our narrow and long living room. (The sofas were bought for our previous house.) We just decided to put one of the sofas against the window, and the other sofa against the wall, making an L-shape. The colorful foam mats were really useful for our babies to play on, but I knew they had to go some time. We were recently faced with the possibility of moving (for professional reasons) and selling the house. So we looked at rearranging the furniture to make the house "more sellable". The room was painted a light beige. We opened up the space in front of the window and bought some sheer beige curtains (as suggested by the lovely Renate Hering-Shepherd). We also bought a wicker chair and moved the living room lamp next to it. This now serves as our cozy reading nook and as extra seating when we have guests over. P.S. We ended up not moving, so we are enjoying our new living room! What a change, Risa! The 'fall' theme works superbly well for the room, the space looks much larger and wonderfully inviting! Love it! I think you've really made the most of the room, Risa! Not sure about a rug, though ... the floor looks so grand as it is, and the color really complements the rest of the interior. Do you NEED a rug? I agree, the 'new' living room looks great, and with just the smallest of changes. Very welcoming and warm. Great job Risa, just goes to show that it doesn't always have to be an investment of 100s of $$$s to make a room look and feel comfortable and 'just right'! Join in and write your own page! It's easy to do. How? 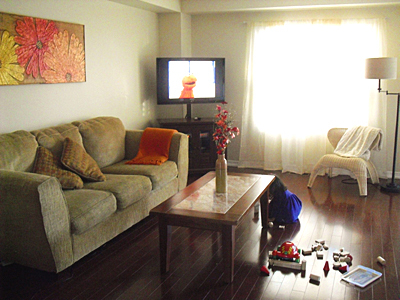 Simply click here to return to Home Decorating Pictures: Before & After.